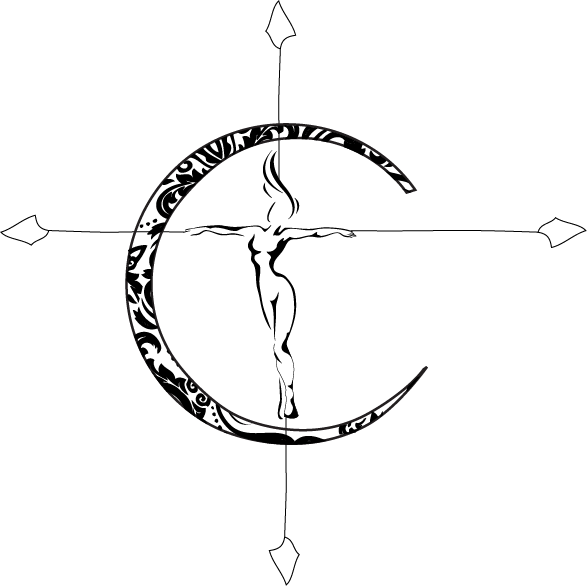 As I have mentioned before, I have a busy schedule. Regardless, breakfast is the most important meal of the day! If I am not prepping a make ahead breakfast for the whole week then I am making sure I have a quick option for the mornings. 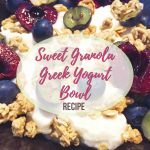 One of the easiest things to make is a Greek yogurt bowl, and it’s extremely beneficial for you! This is something you can eat in a hurry at home before you head out for the day or even have ready in the work place fridge. It makes for a perfect breakfast prep! 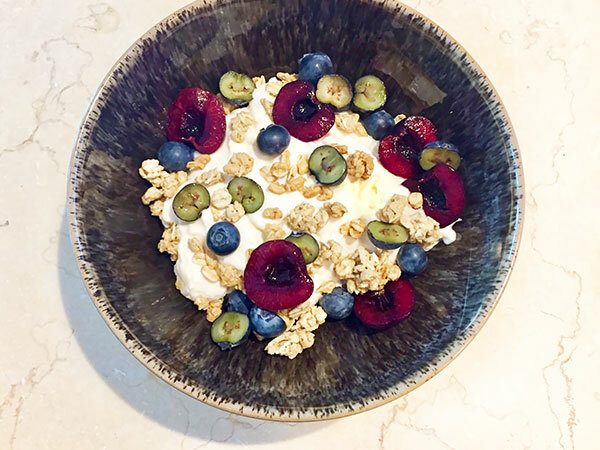 A Greek yogurt bowl is an easy way to pack in a ton of protein in the morning when you are too busy to take time for breakfast. All you really need are a few toppings. Fruits and nuts plus a little bit of granola are my favorites. 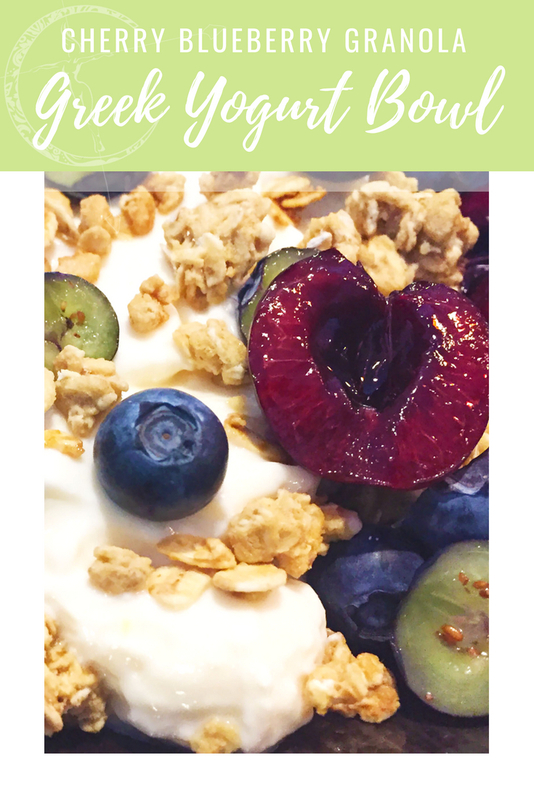 For this one I did a honey oat granola with fresh blueberries and cherries (some seasonal fruits). Just a handful of each is all you need! Scoop the Greek yogurt in to a bowl. Top with the granola and fruit (make sure to remove pits from cherries). Use any flavor of greek yogurt you like! My favorite is the 0% Fage brand (plain) or the lemon or coconut Chobani ones. 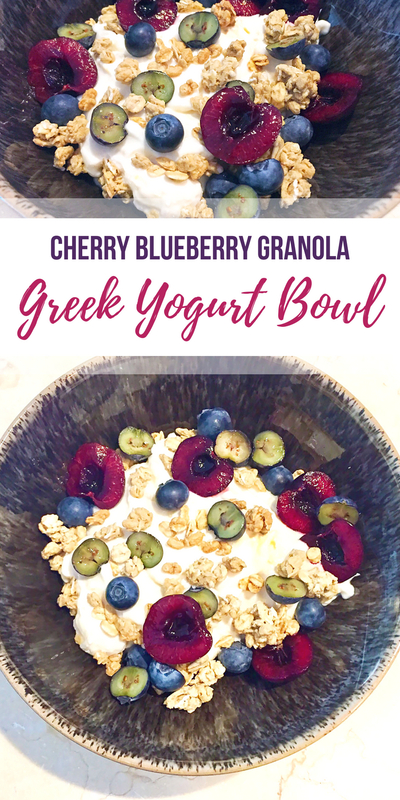 Greek yogurt bowl with cherries, blueberries and granola. Scoop the Greek yogurt in to a bowl. Top with the granola and fruit (make sure to remove pits from cherries). Use any flavor of greek yogurt you like! This breakfast bowl is less than 5 ingredients and takes less than 5 minutes to make. Think twice before you skip breakfast next time!